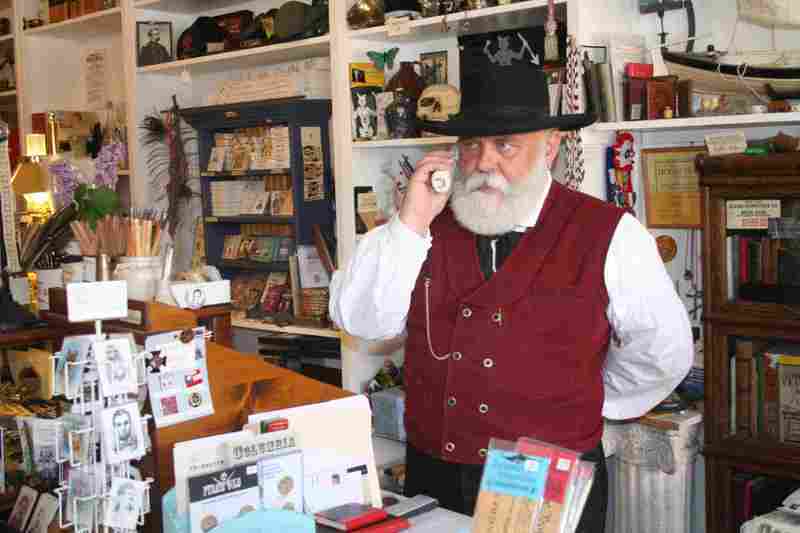 “I’ve always wanted to dress up in old clothes in an old town and lie to kids about history,” says shopkeeper Floyd D.P. Oydegaard. Don’t believe him. Oydegaard is passionate about California’s heritage, as are many people in Tuolumne County, high in the foothills of the Sierra Nevadas. Some 130 miles east of San Francisco and 30 miles southeast of Sutter’s Mill, where the Gold Rush was born in 1848, Tuolumne is known as the main gateway to Yosemite Park. But I think it’s the towns themselves that are fascinating, each one a rebuke to the myth that California is all about the future. These towns disprove another myth, too: that the 49ers were a bunch of poor, illiterate strivers. Truth is, it took money to go west in search of money, for the only way to get there was to pay a stiff fee to join a wagon train or to travel by sea. (The latter featured either a perilous sail around the tip of South America or a perilous trek through Panama’s jungles.) Quite a few of the 49ers were even well-educated, which is why the successful ones poured their loot into fine mansions and even opera houses. Eventually the yellow stuff got harder to find, people moved away, and whole towns stood frozen in time. Today the Gold Rush is still palpable in Tuolumne (rhymes with “follow me”) County, with its frontier building facades, fancy hotels, and bare boulders blasted free of their earthen cloaks by determined prospectors. Stroll these old streets, as I recently did, and you feel like a kid who’s wandered into a cowboy movie. Sonora, at the junction of routes 108 and 49, wasn’t the first settlement in the area gold turned up here a year after the Sutter’s Mill strike–but it soon grew into “the queen of the southern mines.” When much of the town burned down in 1852, it bounced back overnight, so today this county seat features block after block of mid-19th-century, two-story buildings with shops and classic, Wild West shaded walkways. The antiquarian books, mahogany coffee-and-ice cream bar, and upright piano in Legends Books & Antiques make me want to spend the whole day there. I recently spotted someone doing just that, a longhaired guy wearing a battered cowboy hat, weathered jeans, and a ZZ Top beard. He was sitting in an easy chair, reading David Copperfield. My guess is he was probably a farmhand or a prospector–a few diehards are still panning the streams here. The Tuolumne County Museum and History Center occupies a former jail, so in addition to ogling the fabulous antique gun collection and other artifacts, you can step inside 19th-century jail cells. I’m not a big guy, but when I extend my arms in these quarters, my fingertips pretty much reach from wall to wall. That’s tight. Sonora residents call St. James Anglican Church (1860), at the north end of downtown, the “red church.” Arguably the oldest continually functioning church west of the Mississippi, St. James sports a facade of vertical planks painted crimson. Why does this Anglican house of worship look like a Scandinavian Lutheran stave church? Defying all theological odds, the original congregation had an Episcopal minister who was Swedish. 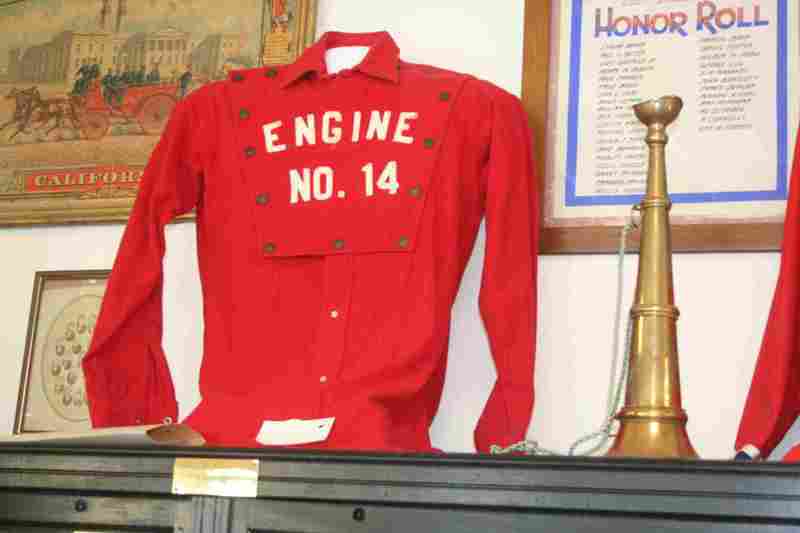 The color red also looms large at the Fire Museum, which displays primitive fire extinguishers, leather helmets, alarm trumpets, and an 1876 fire truck that’s a grownup child’s delight. All this great gear, and Sonora still managed to have two firehouses go up in smoke. Groveland, 24 miles southeast of Sonora, had its share of fires back in Gold Rush days, too, but luckily, the Iron Door Saloon c.1852) survived, and so did the Groveland Hotel (1850). Back then the hotel sheltered fortune hunters; today it serves leisure travelers as a base for day trips to Yosemite, to which Groveland is much closer than Sonora. Hotel co-owner Peggy Mosley, a Memphis transplant, grew up “dirt poor,” as she puts it, next door to a dear friend you have heard of: Elvis Presley. She showed me a photo of herself with Elvis when they served as volunteers in the school library. Who’d’uve thunk it: Elvis as a library squad go-fer. My favorite town in this area? A tough call, but I guess it’s Columbia. Less than five miles to the north of Sonora, this is the frontier settlement of your dreams, with shops, saloons, beautiful Victorian homes on the side streets, a grocery store redolent of sassafras, and a courtroom so tiny that a defendant literally could feel (the) justice breathing down his neck. Founded in 1850, Columbia was the quintessential boomtown — a place where no one had roots–so when gold fever declined, most people simply left. 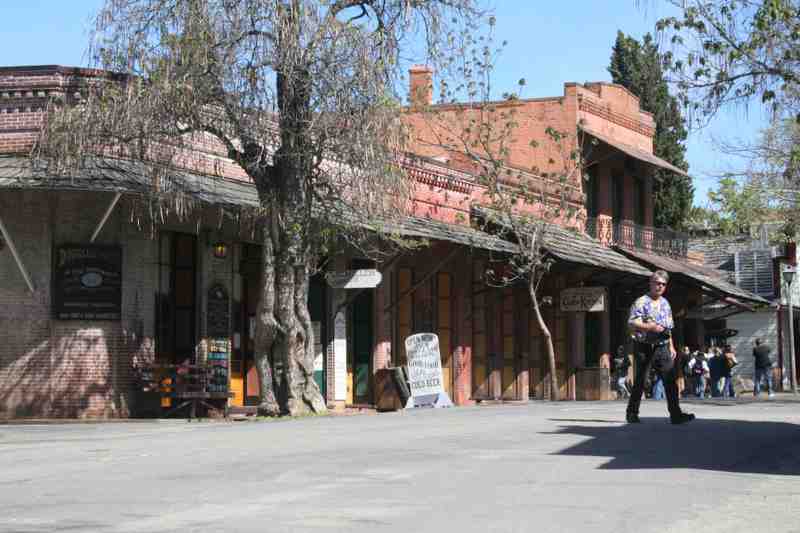 Columbia remained so frozen in time that in 1945 California turned the entire village into a State Historical Park. Hollywood made about 20 cowboy movies here, including High Noon. “My father got a bit part in that movie,” boasts lifelong resident Hoyt Eikins. “And do you remember the scene where Gary Cooper — who, at the time, struck me as being ten feet tall — crosses Main Street and walks up to a house with a white picket fence?” He points at the Wilson-McConnell House, and sure enough, that’s it. Like Oydegaard, who owns the Columbia Gazette Booksellers & Stationers, most of the shopkeepers in town wear period costumes. That would normally turn me off, yet Columbia feels less theme parkish than, say, Williamsburg (thank heavens), and there are two good explanations for that. First, Gold Rush prospectors wore pants instead of breeches and real hair rather than wigs, so the shopkeepers don’t really look like anachronisms. Second — and this is important — people actually live in Columbia. In fact, it’s sometimes hard to tell who’s a re-enactor and who’s a bona fide character, who’s in costume and who’s simply a fashion victim of suspenders. The male half of a couple I met at the St. Charles Saloon (1861) wore overalls and a scruffy beard, the woman wore an inexpensive smock, and I could not, at first, figure out which century they were from. But I could tell that they had started cocktail hour several hours early, so I started a conversation. 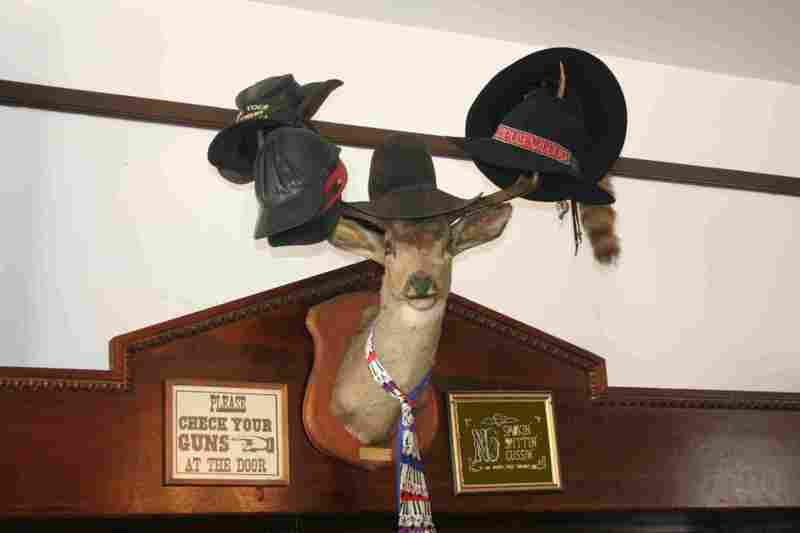 Why, I asked, are there hats dangling from the antlers of the deer head over the bar? “They belonged to friends who used to drink here and have since died,” said the man. The woman whispered, “This was their front room.” They both got a little teary-eyed. I walked up the hill to the old schoolhouse, spotted an ancient pump organ, sat down without anyone stopping me, and played a few verses of “Amazing Grace,” which only seemed right. Then, walking back down the hill, I met Tom, a local whose hobby is impersonating a Gold Rush-era peddler. He was hawking a bottle of “gold grease” for one gold dollar. “Rub it all over you, roll down a hill, and you’ll pick up gold dust,” he promised. Knowing that he wasn’t really trying to sell the stuff, I wondered how he’d react if I actually tried to buy it. So I pulled out a dollar bill. “I’ll take one,” I said. Gunn House Hotel. A B&B with an 1850 pedigree, 12 antique-filled rooms (ask for #19), and a swimming pool. Rates, including a lavish breakfast featuring home-baked pastries, from $69. 286 S. Washington St.; call 209-532-3421. Fire Museum. 125 N. Washington St.; call 209-532-7890. Legends Books & Antiques. 131 S. Washington St.; call 209-532-8120. St. James Anglican Church. 42 Snell St.; call 209-532-7644. Tuolumne County Museum & History Center. 158 W. Bradford Ave.; call 209-532-1317. 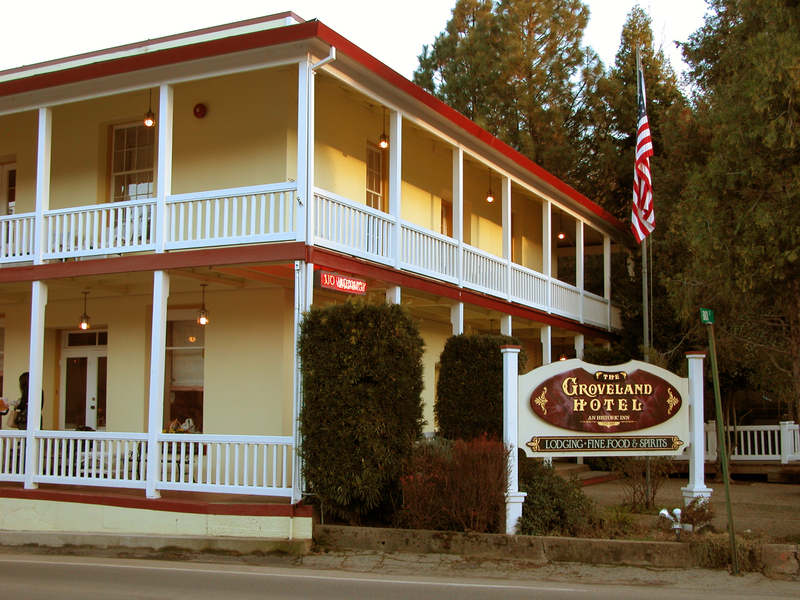 Groveland Hotel. 17 guest rooms and suites with antique furniture, wi-fi, a superb restaurant and wine cellar, and a ghost named Lyle in room 15. Rates, including an extraordinary breakfast, from $145. 18767 Main St.; call 800-273-3314. Iron Door Saloon. 18761 Main St.; call 209-962-8904. Columbia City Hotel. 10 antiques-furnished rooms in a brick building dating back to the 1850s and ’60s (talk about bad timing; the original hotel burned down in 1854, five days after its second owner bought it). Rates, including breakfast, start at $125 for a room with a half bath. 22768 Main Street; call 800-532-1479. Fallon Hotel. 14 period-style rooms in a complex that experienced its last fire in 1869. Like the City Hotel, its sister property, some of its rooms have a half bath. Rates, including breakfast, from $90. See contact information above. Columbia Booksellers & Stationers. 22725 Main St.; call 209-533-1852. St. Charles Saloon. Corner of Jackson and Main streets. Call 209-533 4656. Columbia State Historic Park. 11255 Jackson St.; call 209-588-9128. 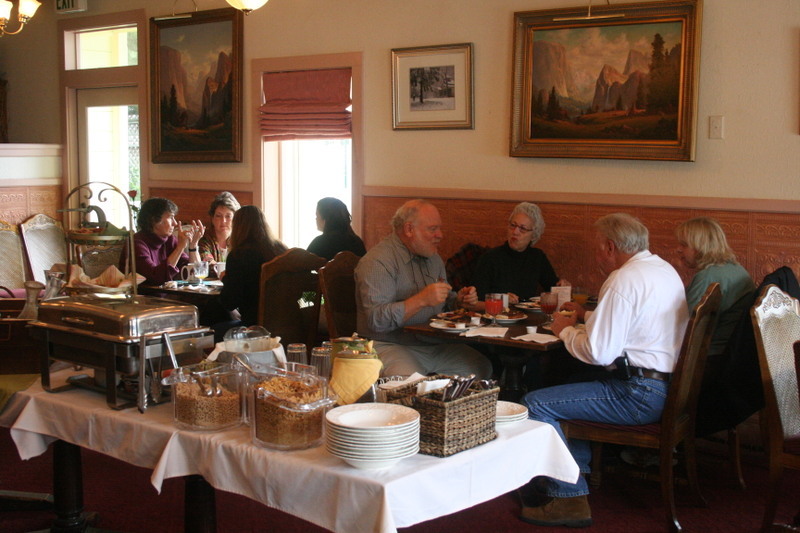 TUOLUMNE COUNTY VISITORS BUREAU. Call 800-446-1333 or 209-533-4420.